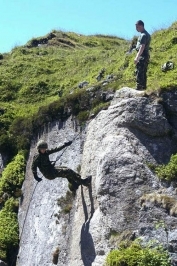 Cliff Assault The Royal Marines training is the longest basic infantry training programme of any NATO combat troops. To deliver commando trained marines, commanders and specialists ready for operations whilst supporting the Front Line. The Royal Marines is the only Service in which officers and recruits are trained at the same place, The Commando Training Centre Royal Marines Lympstone, and undergo the same physical tests.